One of my coworkers gets the official publication for the National Italian-American Foundation. He leaves them in the men’s bathroom, I presume because he wants us all to delight in photos of various Italian-descended celebrities wearing nice clothes and wrapping their arms around other Italian-descended celebrities wearing nice clothes. Actually, I think this may his only motivation for receiving this publication at work. It’s kind of like how I put copies of Allure and Bust in there, just to confuse people. Anyway, once recent issue of the NIAF magazine featured this below image as part of its cover. Doesn’t this seem just a little strange? Not so much that a group wants to salute a cocktail, I guess — preppies have been saluting the gin and tonic for years, so why shouldn’t that right be extended to specific ethnic groups? No, I’m more disturbed by the fact that a notable person would perform at the event dedicated to the thing that ruined her life. (Well, that and pills.) 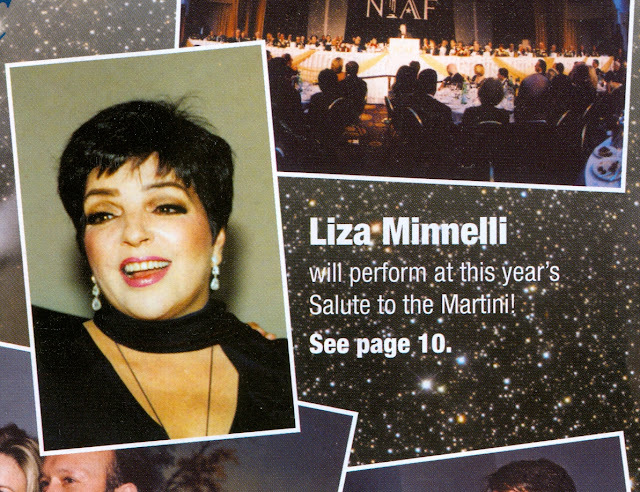 Liza Minnelli performing at a salute to the martini is a little like — what? — Robert Downey Jr. performing at a salute heroin? Pamela Anderson performing at a salute to hepatitis? Mary Tyler Moore performing at a salute to diabetes?